Long before I ever needed to worry about keeping the doctor away, I was your average apple-a-day kind of gal for many years. First it was the rosy kiss of Red Delicious apples, then the crisp, juicy tartness of Granny Smiths. Then I gradually lost interest in them altogether. Sure there was the occasional flaky pie, muffin or crumble, but essentially I had grown bored of apples. We were lucky enough to visit the US late last year during what I would consider perfect weather. The frost had not yet set in, and arrangements of pumpkins were still gracing door steps. It was during this trip that my interest in apples was reignited. 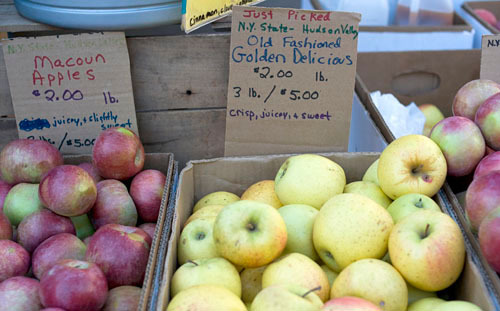 In New York there was hot cider on sale at every market we visited and a dazzling array of heirloom apples filled boxes and baskets in many fresh produce stalls. We had a simple but tasty sugared apple tart at City Bakery and a very memorable slice of lard and butter-crusted apple pie from Shandaken Bake. Just picked, cute as a button Lady apples were presented to us as petit fours at Dan Barber’s restaurant, Blue Hills. In San Francisco, I had apples, mascarpone and hazelnuts on generous slices of pan de mie at farm:table, and pickled apples and cajeta at Napa Valley’s Ubuntu. Bored of apples? What was I thinking! Now in Sydney, this gentle change from Autumn into Winter reminds me of our trip and has me dreaming of apples. I was recently gifted an ice-cream machine by B’s co-workers, hence this candied apple ice-cream, which when paired with pickled apples and a spoon or two of oat crumble, creates a smile that starts at the corners of your lips and ends deep in your belly. Place all the ingredients in a Thermomix. Cook to 76’C and pass through a fine strainer. Chill well (preferably overnight) before churning in an ice-cream maker. In a pot, scald the milk, cream, cinnamon and glucose. Whisk the egg yolks in a large bowl, add slowly add half of the hot milk mixture, whisking to combine, then pour all the contents of the bowl into the pot, whisking. Turn the heat down to medium and stir the mixture continuously until it reaches 76’C. Strain and chill well. Add the candied apples that have been pureed and strained before churning in an ice-cream machine. In a large pan, combine the sugar, lime juice and water. Bring to boil over high heat. When the sugar begins to turn a pale yellow (130’C), add the apples and continue to cook over medium heat until the apples are translucent, about 15 minutes. Strain the apples and allow to cool on a lined tray before using. You make apples sound exciting again 🙂 The poor apple suffers from its ubiquity doesn’t it? The words ice-cream and candy made me sit up and take notice though. Brilliant, as usual. I play the field when it comes to fruits so that I don’t get bored with any single one of them. 😉 This ice cream sounds delicious! Ah, while America turned you back onto apples, it turned me off… though not in the way you’d expect. I used to happily buy and eat apples here in Australia, but when I spent a year at UVA I had the luxury of a family friend bringing me apples direct from his orchard- apples so fresh and unique and natural that many didn’t even have names because of cross pollination. They tasted so brilliant that I’ve never been able to enjoy apples since.At least not in raw form. That ice cream sounds marvelous! A fabulous flavor. I love apples, too! They’re the perfect fruit because they don’t rot as quickly as some other fruits, so I always buy some at the grocery store. I think Pink Ladies are my favorite. This ice cream sounds wonderful! I don’t know if I’ve ever had apple ice cream before. Anything with apples will satisfy me. This looks so good. Sounds so lovely! I assume you have a thermomix from that recipe, I have been toying with getting one myself but I wonder about the capacity? Any advice? This is a keeper. A lovely and sweet idea. I don’t believe I ever had candied apple ice cream before. You’ve managed to read my mind and solve my question all at once! I had been thinking a candied apple ice cream would be awesome, but wasn’t sure how to go about it. What a delicious solution! Apples are one of my favorite parts of fall – crisp, refreshing, and perfect for all sorts of desserts. I can’t wait for fall so that I can get good, fresh apples and make all of them! I always appreciated the humble apple, but when I lived in Boston – and experienced my first apple picking session – I was hooked. There is something quite amazing about eating food freshly picked. I think after chocolate, apple is my favourite core ingredient in desserts. I’m not sure if I would ever get sick of apples. But I know I’m sure I would never have thought of apple ice-cream. Great idea. Wonder how this would be paired with apple pie? Too much???????? Sooo good! Can I have one serve, please? Its the height of summer here and perfect ice-cream season. Candied apple, hmmm. One more flavour for me to try out. lovely flavour it must be. our apples in the orchard had just finished last week. now, we have to buy them again from farmers market or local growers. pity they can’t grow all year round, aye. I grew up in London with apples always playing the start role for dessert be it a crumble, a pie or a cake. And while I wouldn’t say I was ever sick of apples I rarely crave an apple-themed dessert. Candied Apple Ice-Cream however sounds irresistable. The thought of it reminds of me why apples converted into something sweet is the best treat. The day I get an ice-cream machine this flavour will be made! A smile that ends deep in your belly sounds just lovely! I’m glad the autumn weather is bringing you such nice memories. It sounds like a good trip. love the home made ice creams ! !perfect !! oh god.. wish i had an icecream maker!!! It’s so hard to wake up in the morning now…if only humans hibernated. 😀 I love apples, I love Fuji apples the most because they are crunchy. Fruit desserts are always good, they feel more healthy. It counts as a part of my daily intake of fruit, right? Hot cider would be nice right now! Or the ice cream! InTolerantChef : Hi! Sorry for the late reply. There have been Thermomixes in most kitchens I’ve worked it. I think it was originally designed to be a domestic tool, but it’s very useful in a commercial setting as well. Yes, it doesn’t have a massive capacity, but you can easily do things in several batches, if need be. I haven’t really found it to be an issue. Julia @ Mélanger : Definitely not too much. We had some of the ice-cream with apple crumble and it was great 🙂 Also couldn’t agree with you more about how amazing freshly picked apples are. I saw your post just a day before I was invited to join one of those in-home demo….and thought, brilliant! Saw that the machine only have a 70C and 80C button… how do you cook it to 76C? Wow, the thought of this ice cream is making me consider running out and purchasing an ice cream maker! I just realised I don’t think I’ve ever had apple ice cream before! Hi pigflyin, Well that’s actually one of the flaws of the Thermomix. You can’t set the temperature any more accurate than the given increments. If I want to cook something at 76’C, I set it at 80’C and check the temperature with a thermometer every now and again. Hope that helps! Hi Y – Certainly helped! Too bad Mycook and Thermomix both got the same limitation…. sigh. cannot be truly lazy afterall. I really want an icecream maker. Its a great idea using the candied apples. I’m going to America at the end of the year, definitely looking forward to exploring the food culture there! I have booked marked this page and I will be making this ice-cream for sure. I can almost taste it already! Mmmm and now you have me craving an apple. I go through phases and now you have pulled me back in. Amazing ice cream! Great recipie. I just finish to make my Zabaglione Ice-cream and still having some cream and eggs left for have plenty ice-cream for the weekend! This is absolutely great for summer! I love the use of cinnamon with apples, they’re always a comforting mix. Thanks for the sugared apple recipe too, I can use it in other dishes. Well…the apple harvest is now on this is a great recipe for the season. Thanks for sharing. 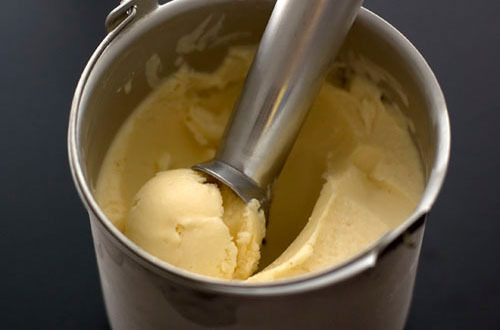 I just love this apple ice cream, I can just imagine it on homemade doughnuts!